Our dental office in downtown Toronto uses the latest dental technology and individualized patient care to identify dental problems that ultimately affect your overall health. This method allows us to take aesthetic dentistry to the next level and become more than just your dentist but your overall wellness partner. With over 3500 hours of continued education, Dr. Cheng is passionate about dentistry in Toronto. He leads by example for our dedicated team of dental professionals to follow. We use our training to educate you on your dental health so you can care for your teeth long-term. We make it our aim to accommodate your individual needs and place you as our priority. We offer a range of comforts and conveniences, such as opening hours on Saturdays and downloadable patient forms. Making decisions about your smile is a huge investment. Come in for a consultation to get another opinion from Dr. Cheng. Information is vital! We want to give you the knowledge you need to make the best decision for your oral health. We understand that sometimes that means reconfirming a diagnosis with another source. At Dentistry on King, we will never recommend treatment you don’t need. Quality dentistry, genuine care, and specific training are a few reasons why patients choose him. A smile is the universal symbol of happiness, and everyone wants a healthy smile. Dr. Cheng and your smile team are committed to bringing modern dentistry to your family. Our caring staff knows your dental health is important to you, so it’s important to us. At Dentistry on King, we offer general, cosmetic, restorative, and implant dentistry in Toronto. If it has been a while since you’ve been to the dentist, you may find yourself amazed at the modern dental technology we offer. The dental industry is forever changed and will continue to evolve as a result of technology advancements. As advancements in technology continue, Dr. Cheng knows how important it is to stay up-to-date with the latest in preventive care, diagnostics, and treatment. He believes patients always come first and has handpicked a friendly team to ensure your visits are comfortable, easy, and painless. 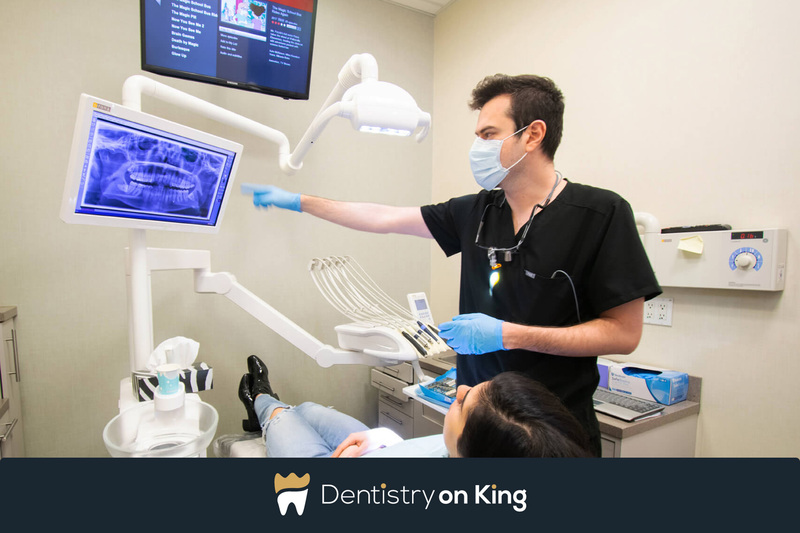 Since 1987, Dentistry on King in Toronto has provided patients with the knowledge, expertise, and technology to treat most dental problems from the necessary check-up to full smile makeover. If you have a question about your dental health or are looking for a Toronto dentist, contact our office today. Receive customized dental maintenance programs and treatments that help all aspects of your daily life. A Toronto dentist providing family dental services designed to improve your overall health. For a more attractive, brighter smile you will show off constantly. Restore your missing tooth with absolute precision and efficiency. Please contact us directly at 416-368-8000 if you have any questions. We’re fluent in English, Cantonese, Tagalog, Russian, and French. Contact us below if you have any questions. You can find our office in downtown Toronto. Download our patient forms right from our website to fill out in your home. Be sure to bring them with you at your first appointment. Take a look at our smile gallery and see the smiles created by Dr. Cheng. Schedule a consultation to see what he can do for your smile. Achieve it with Dr. David Cheng – your dentist in Toronto.